When you are presenting with PowerPoint slides you know it’s important to establish eye contact with your audience. But did you know how important it is? There’s more to it than just looking presentable. So much more to it than quick or covert glances to the back of the audience. And that’s why PowerPoint eye contact is important for your presentation. When you hold someone’s gaze you also hold their attention. They participate with your presentation directly. Instead of a one-to-many, presenter to audience relationship you establish a one-to-one opportunity. With each audience member. Your presentation is targeted at each member of the audience with whom you establish eye contact. For example, look directly at someone in your audience. Look for their concurrence to a point. Hold their gaze. They will agree with your point with a nod, if you don’t look away. By holding their gaze you establish a link with your audience. And they will not be able to break your look. You’ve achieved some audience participation. 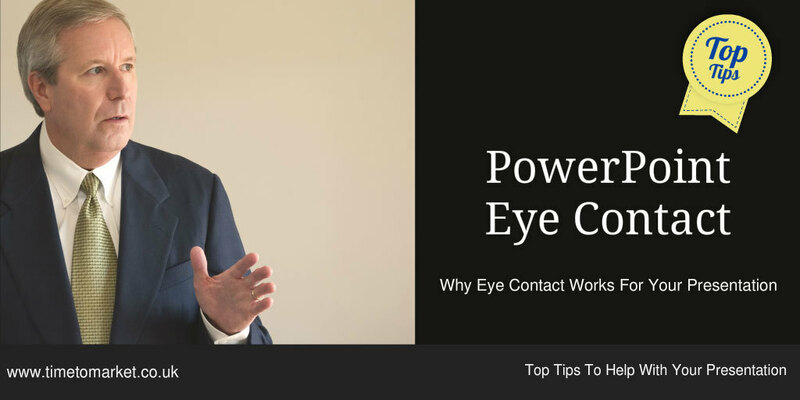 Some simple steps will be all you need to use eye contact in your presentation. Look directly at someone in your audience. Search for their agreement to one of your points. Wait for them to nod in agreement. Now, look at someone else as you make another point. And, just because you are using PowerPoint, it’s no different. There are many ways to achieve PowerPoint eye contact when you give a PowerPoint presentation. You can find out this and other PowerPoint presentation skills tips on a PowerPoint presentation skills training course. Once your audience starts to participate with your presentation you are making good progress. They are more likely to understand your presentation. More likely to believe in the veracity of your points. Direct eye contact leads to active listening, interaction, understanding and belief in your presentation. If you can achieve all this, then you are well on the way to securing audience engagement. And that’s something that every self-respecting presenter wants. And, that’s why business leaders use autocue when they give a presentation…such as in this Alan Mulally presentation. For more skills tips, you can always attend a PowerPoint presentation training course. So, please don’t hesitate to get in touch when you need to discuss.